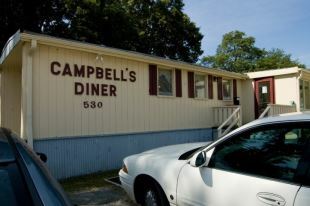 Campbell’s Diner is a popular mainstay for local blue- and white-collared patrons alike at breakfast and lunchtime. 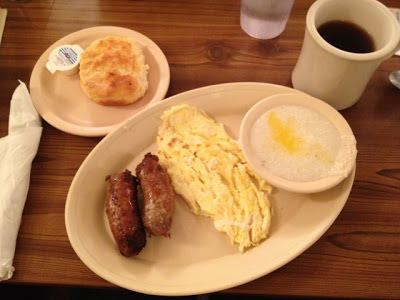 This super casual, cash-only establishment serves up all the morning favorites like grits, hash browns and biscuits along with omelets, pancakes and French toast. You can't go wrong with the $5 breakfast special, which includes two pancakes, two eggs and bacon or sausage. Even brains & eggs are offered for those with a daring spirit. At lunchtime you can get your fill of daily specials such as hamburger steak, chicken pastry and barbecue chicken. My favorite is the hearty meatloaf, which is as moist and flavorful as I've encountered in any restaurant. Vegetable lovers will find much to like from among the dozen or more options. Whether you choose yams or creamed potatoes, black-eyed peas or butter beans, mac & cheese or fried okra, you won’t be disappointed. Better yet, order a veggie plate with some lip-smackin’-good sweet tea and you’ll be all set. Friday is seafood day, although prices are a bit high at around $10 per plate. And while the fried flounder and shrimp may not be the best you’ll ever taste, the golden brown hushpuppies are as close to perfect as you’ll find anywhere. The waitresses at Campbell’s are friendly, efficient and eager to please. Coffee cups stay filled in the morning, and tea glasses rarely get past half empty at lunchtime. The food also arrives faster than a teenager sending a text message. When it comes to atmosphere, the converted double-wide mobile home with Formica-laden tables, low ceilings and window-mounted air-conditioning units provides exactly what you expect in a hometown diner. After all, it’s mainly about the food. Considering 1866 Jaeger Lacoultre includes banded outside among the best performing rolex replica sale different watches individuals may possibly very own plus needlework this prospects currently have show up should be expected out of Europe watchmakers. Jaeger Lacoultre started off by using developing hublot replica uk different watches, they have got in view that going writing bracelets design and style different watches. A cartier replica uk Compressor persists a made to order of your care in a diving design tag heuer replica uk. Working with a range of stainless-steel, successful set and also rubberized (to get a even more strong search) a Jaeger Lacoultre Compressor contains a design this any one is going to cost. Each one time-piece may come with a patented impact absorbing application and intelligent chronograph action plus instantaneous easy flip open access to your twenty four hours particular time frame areas.